Weighing scales are concealed in a compartment inside the net handle. On landing the fish, just pull out the scales and weigh the fish in the net. Trout scales measure up to 14lbs. Fixed frame with hinged handle. Telescopic handle with rubber grip. Weighing scales to 14lbs. Easily operated with one hand. Handle extends from 22" to 32.5". Attach with Rose Creek net release. 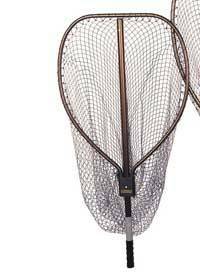 Net opening 19.5" by 17.5", net depth 27". Overall length 52.5". Knotless mesh. 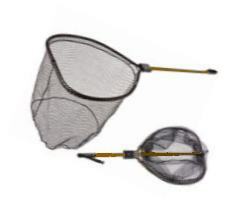 A folding arm triangular net with optional scabbard. Telescopic handle with rubber grip and in-built weighing scales to 14lbs. Folds into scabbard, with belt attachment. Clip will attach 'D' ring. Handle extends from 21" to 33". 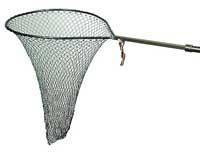 Triangular net is 21" wide and 20" deep. Overall extended length 49". Knotless mesh. 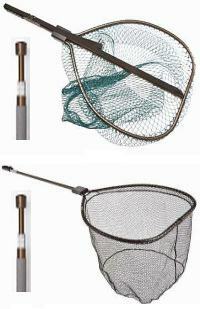 McLean Weigh Nets have surely been present at a good many memorable moments in Angling. The Short Handle Weigh Net has a doubly-accurate scale. Weighing up to 6.5lb and readable in 2 oz increments. Mclean Sea Trout / Specimen Weigh Net 25"